PG Entrance Test will be conducted in last week of May 2019. Hall Tickets are available online only 10 days before the exam date. Official website to apply online and for downloading hall tickets is www.svudoa.in. Online submitted copy must have submit to the Sri Venkateswara University by person or through registered post. 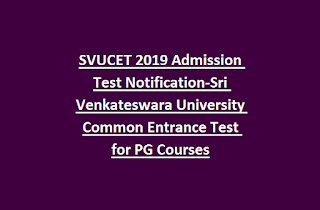 Detailed information of this SVUCET 2019 Admission Entrance Exam is updated below. Last date for online application print out: 13-05-2019 at 5.00 pm. 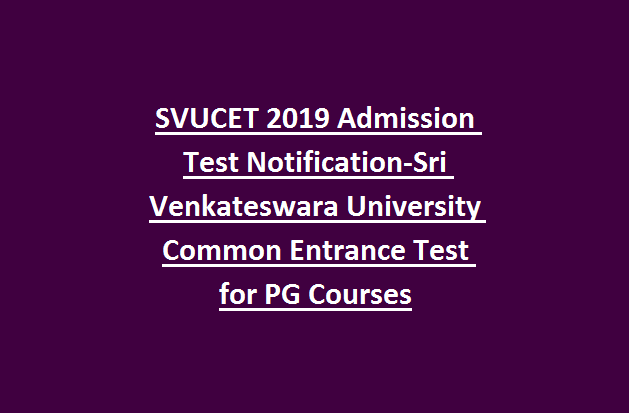 Degree qualified or degree final semester exam appearing candidates are eligible to apply for this SVUCET 2019. Application fee is Rs.300 for SC/ST/PH and Rs.400 for OC/BC candidates. SVUCET 2019 will be conducted for 100 Marks. If applications are received very less, then there is no entrance exam will be conducted for that particular course. Exam Syllabus is 3 years degree syllabus for respective course. Eligible candidates can apply online for this SVUCET 2019 through official website of www.svudoa.in. Hall Tickets for this SVUCET 2019 will be available from 10 days before the exam date.